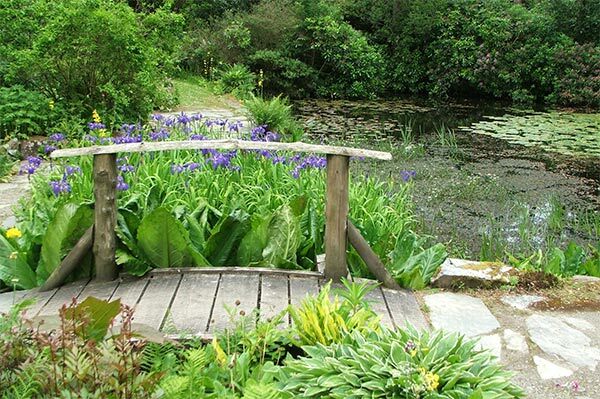 Arduaine is a beautiful open garden near Oban in Scotland. 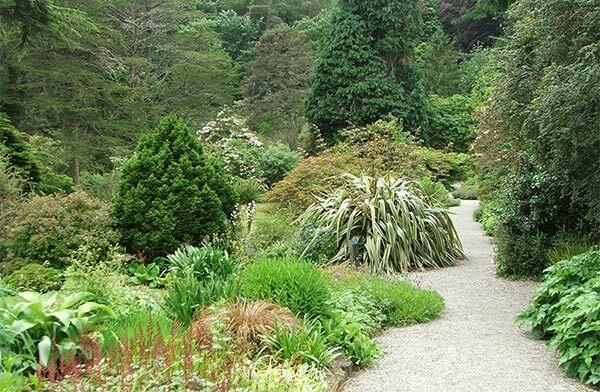 Though it is now run by the National Trust for Scotland, the garden feels private and peaceful, and its beautiful beds and borders are a foliage feast. And Arduaine's Head Gardener, Maurice Wilkins, is a legend! Rhododendron enthusiasts would love Arduaine - they could write down lists of names and photograph the huge collection. 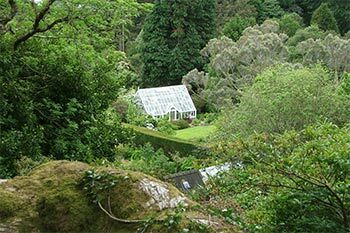 I visited in mid-summer, when most of the species and hybrid rhododendrons had finished flowering. But there were other foliage delights, and huge specimens of New Zealand origin, to keep me happy. The perennial borders at the entrance set the textural theme, happy plant neighbours contrasting the size and shape of their leaves. 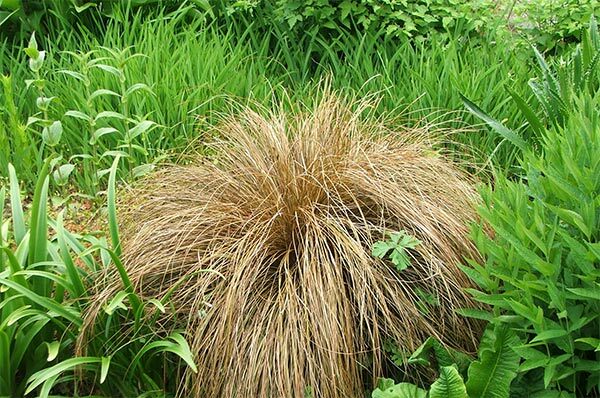 And I see my very first stylish brown tussock! I, too, plant carexes in with my perennials and roses. There's a wonderfully large Olearia in full white flower. This 'Tree Daisy' has been a compulsary planting in all the Scottish West Coast gardens, though I've never seen one in the bush in New Zealand, or in a garden centre. Perhaps Highland gardeners know something that we don't? 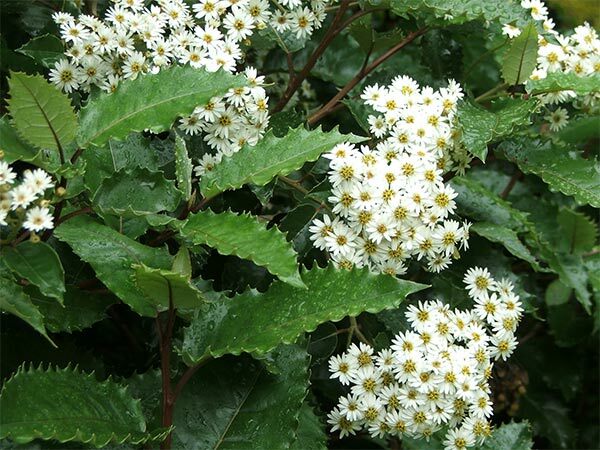 The brochure (which I read later) names it as Olearia Macrodonta, or New Zealand Holly - which I've never heard of. Oops. I want one. 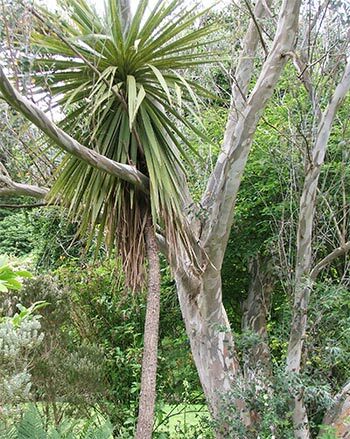 The brochure, written by the head Gardener Maurice Wilkins, also claims that the New Zealand Cordylines, my favourite cabbage trees, add an 'exotic' feel to the traditional border plantings. Hee, hee - New Zealand gardeners might grow more of this national icon if they read Maurice's encouraging words! I see fuschias, a copper beech tree, glossy Camellias underplanted with non-functioning bluebells, and a row of Hypericum shrubs. Some of the rhododendrons had the hugest leaves, and the reddest trunks. They were more like trees. The birds were busy in the leaf letter, making rustling sounds like a dozen busy gardeners. As I watched them scratching away I felt small and blessed, taking my solitary dreamy place in nature - it was a very special, spiritual moment. Time stood still, alongside me. 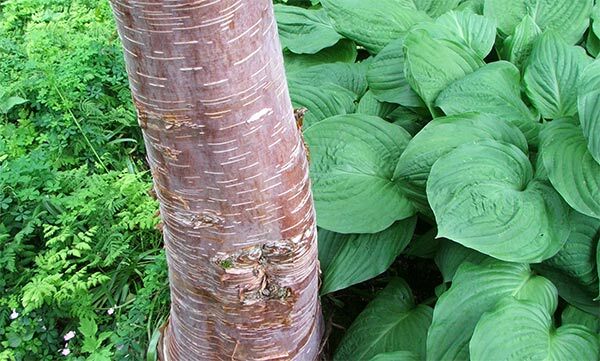 I kept finding more and more delights for foliage lovers - like ribbed hostas planted underneath a beautifully-barked Prunus Serrula. Then of course I found the compusory Gunnera, that flamboyant super-hero of the British Pond Garden. The blackboard sign in the small visitors centre reads like a restaurant menu, offering the 'perennial of the day' and such. That Head Gardener has a great sense of humour! He also wrote the brochure, which makes a great nostalgic bed-time read, millions of miles away in another season. Just before leaving Arduaine I came across some less positive signage, erected just over the boundary. The Wright brothers took over the gardens in 1971 and gifted them to the National Trust for Scotland in the year 1992. According to the signs, things since have not gone according to the Wright brothers' expectations, and so their complaints against the Trust are itemised for all to see. For me this was a slightly unhappy end to a wonderful visit. 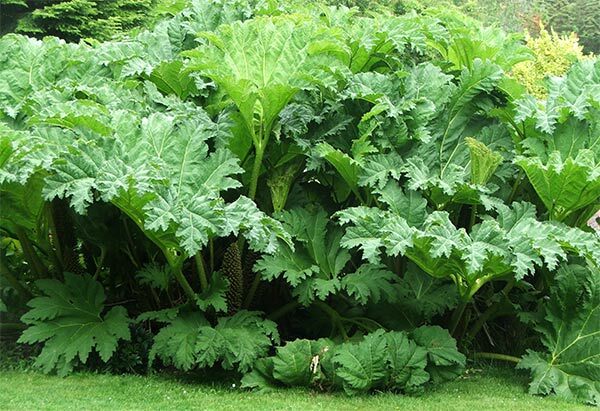 The only divisiveness that should be allowed in a garden is of the herbaceous perennial nature, every three or so years, with two sturdy spades - or a steak-knife from the kitchen! But I understand the ex-gardeners must feel frustrated at not bering heard properly. Gardens are awfully personal at times. Arduaine is a green and peaceful place, and must remain so.